The records indicate that Frank A. Weil was a member of the Distribution Committee and Trustee at Large of Federation’s Board of Trustees from 1965-1968. 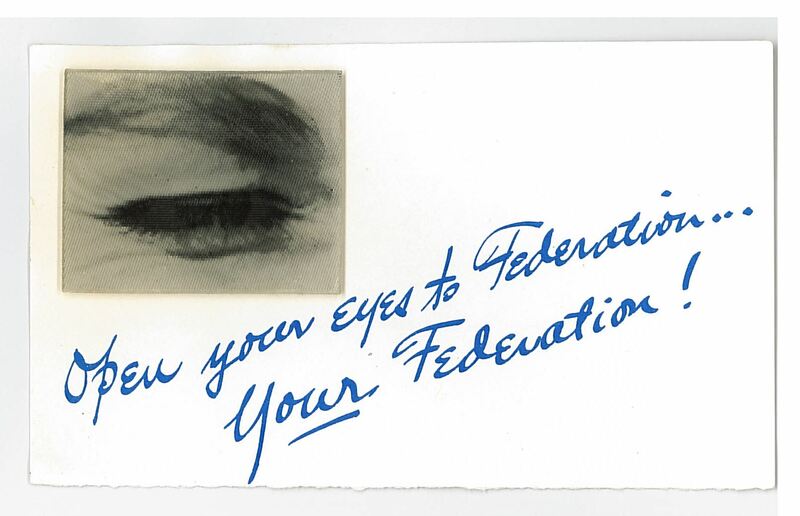 He was also Secretary of Federation in the mid-1970s. An attorney, he was a senior partner of the Washington law firm of Ginsburg, Feldman, Weil and Bress. He was Chairman of the Finance Committee and Chief Financial Officer of Paine Webber, Inc. from 1972 -1977, and he headed the International Trade Administration of the United States Department of Commerce from 1977-1979. Rabbi Trainin was hired by Federation in 1954 as an adviser on Religious Affairs. In his more than 30 years at Federation, Rabbi Trainin created the Department of Religious Affairs, the Committee on Religious Affairs and the Commission on Synagogue Relations. 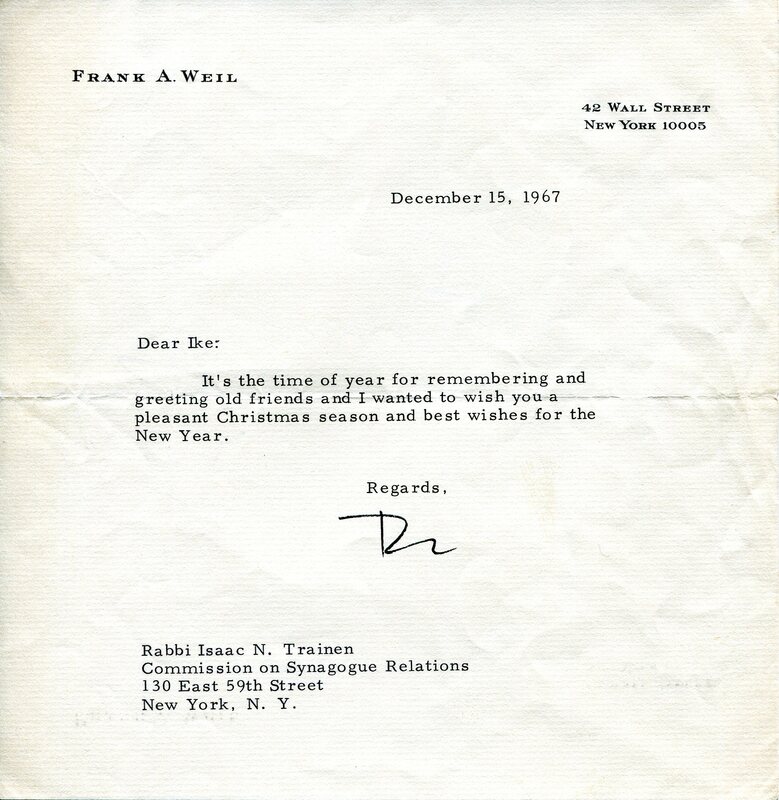 This letter was found in Rabbi Trainin’s correspondence in his files from the Religious Affairs Department. Later posts will delve into more detail on his work at Federation. Processing the archival materials of Bob Smith’s Public Relations Department at FJP certainly was fun! 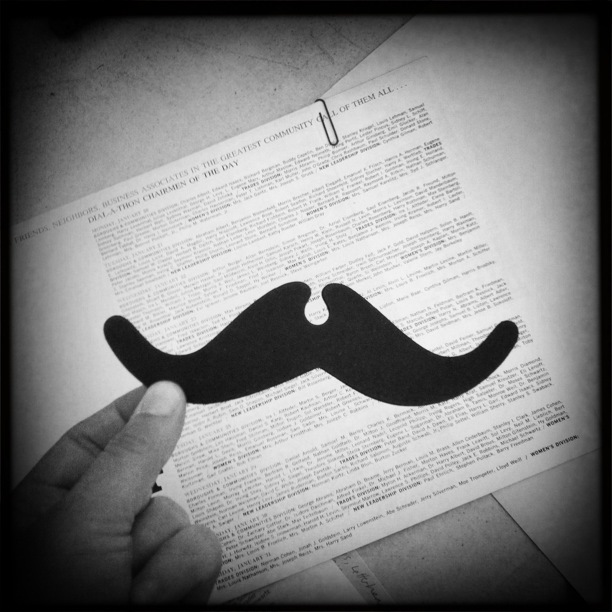 The paper false moustache pictured above was included with a packet of materials prepared by the PR Department for a Federation Dial-A-Thon event that took place sometime between 1960 and 1965. This event apparently had and “old time” theme and the PR team must have thought various board members and celebrities pitching in to make fundraising phone calls while wearing these disguises would make for memorable photographs. We will find out if any such pictures survive when we complete processing the FJP photographs. To fully appreciate the promotional item from the FJP PR series below, you must take a few seconds to watch this short video. This type of image is called a lenticular print. You may call it a “flicker picture,” though if, like me, you were born in the 1960s or 1970s and remember encountering some of these things as prizes in Cracker Jack boxes. It is a little like an analog version of a GIF file in that it combines two separate images to create the illusion of motion. The curved ridges on the surface of the lenticular print are what fuse the images together. More recently, lenticular print technology has evolved to incorporate more images per print for the illusion of a greater degree of motion and even three-dimensionality. 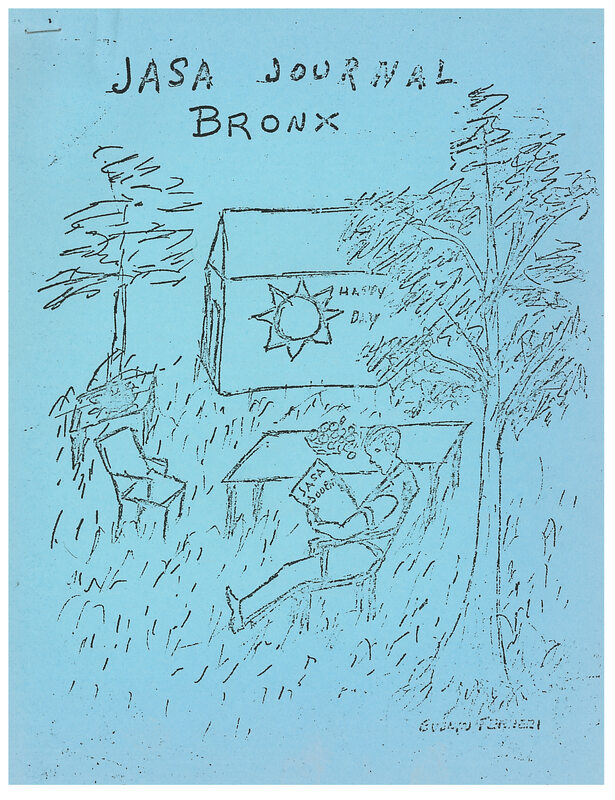 This card was included as an insert in an invitation for an event the Great Neck division held in 1963. This inventive item designed and produced by the PR department helped Federation donors calculate their contribution and see in very concrete terms the good that their money did the community. A circular piece inside the card could be rotated to reveal various contribution levels, multiplied by the number of agencies affiliated with FJP and described what their gift paid for in the small windows on the right of the card. These are just a few examples of lively and surprising fundraising items contained within the FJP PR series. If any of you have received similar silly mailings over the years, we’d love to see them. In processing the files of various Federation consultants on medical care and care of the aged, I encountered an agency-published journal, almost a zine, created by the Jewish Association for Service for the Aged (JASA) in 1977. 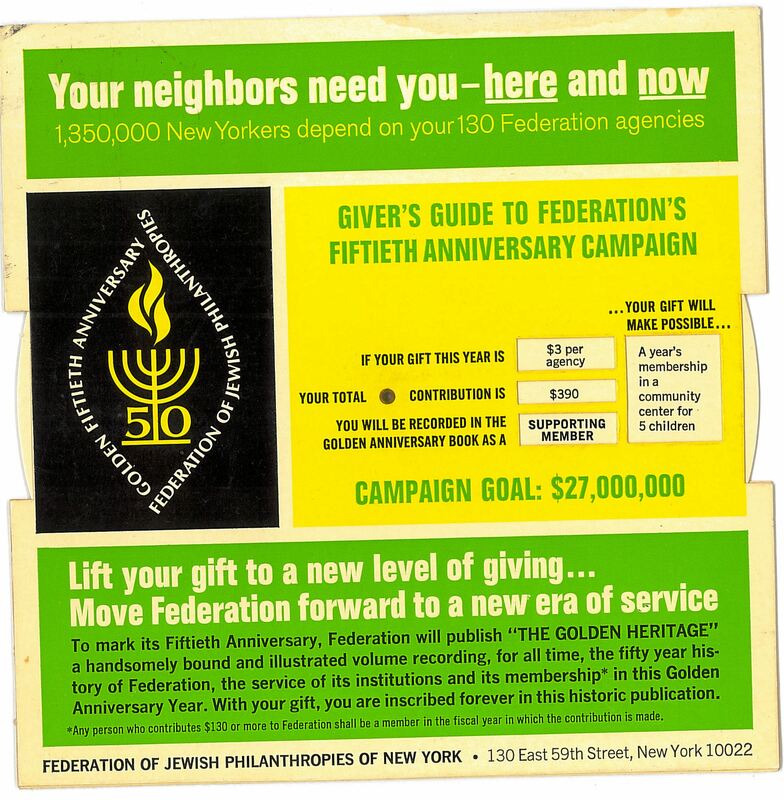 At the time of the journal, the Association was less than ten years old and closely affiliated with the Federation’s goal of providing care and assistance to the Jewish elderly in the metropolitan New York area. JASA’s services in the Bronx falls into two major categories: individual services (casework) and group services…Group services include six JASA-sponsored programs, five of them co-sponsored with synagogues and the sixth located in a housing project. Two of these programs operate one day a week, three meet twice a week and one is open five days a week. An additional eleven independent programs that have no government funding receive help through the JASA Recreation Program for the Elderly, in the form of teachers, lecturers, entertainers, and trips. Answer the phone when it rings. When you walk through JASA’s door.